By Rocky Saenz, D.O., Lauren Corley, D.O., Zack Franks, D.O. 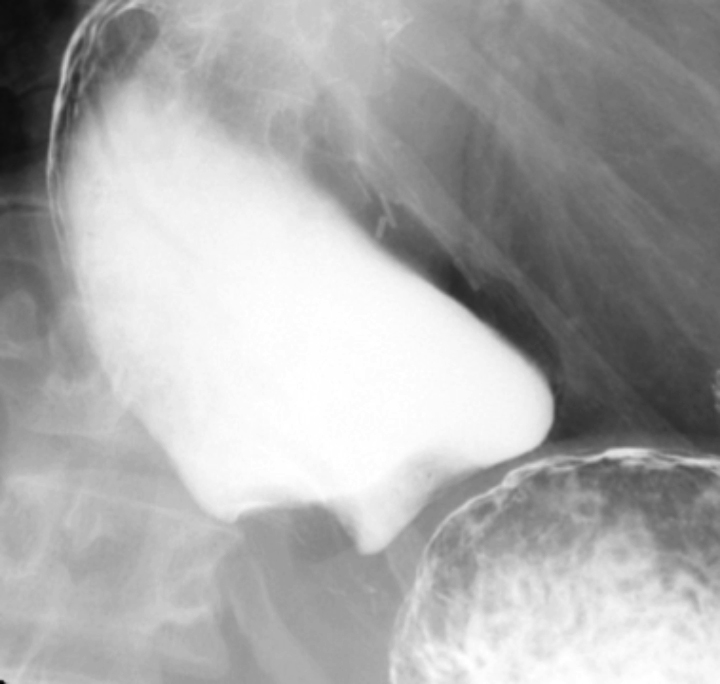 A 58-year-old woman presented with long-standing dysphagia without weight loss or hematemesis. She was subsequently referred for an upper GI (UGI) examination (Figure 1). 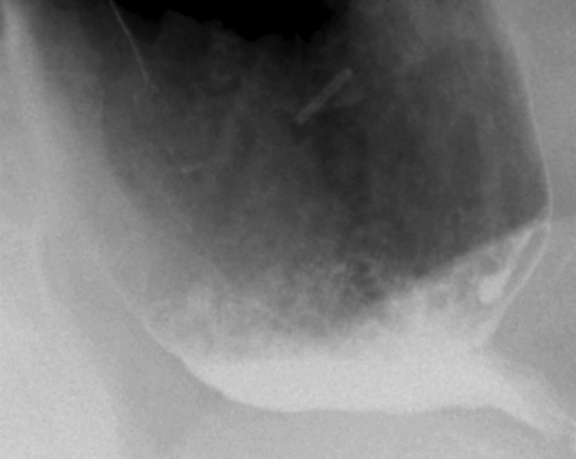 Dysphagia is a common indication for an UGI fluoroscopy examination or esophagography. The goal of imaging is to identify mucosal irregularity, ulceration, or stricture. There are numerous causes of distal esophageal strictures with the most common etiologies being esophagitis from a variety of causes, achalasia, and malignancy.1,2 Classically, malignant strictures have a recent onset of rapidly progressive dysphagia and weight loss, while benign strictures present with long-standing, nonprogressive dysphagia.1 The most common etiology overall of distal esophageal narrowing results from gastroesophageal reflux disease (GERD). Esophageal carcinoma is most often squamous cell carcinoma (SCC), followed by adenocarcinoma. SCC is typically seen in the proximal two-thirds of the esophagus, while adenocarcinoma is more common in the distal one-third of the esophagus. 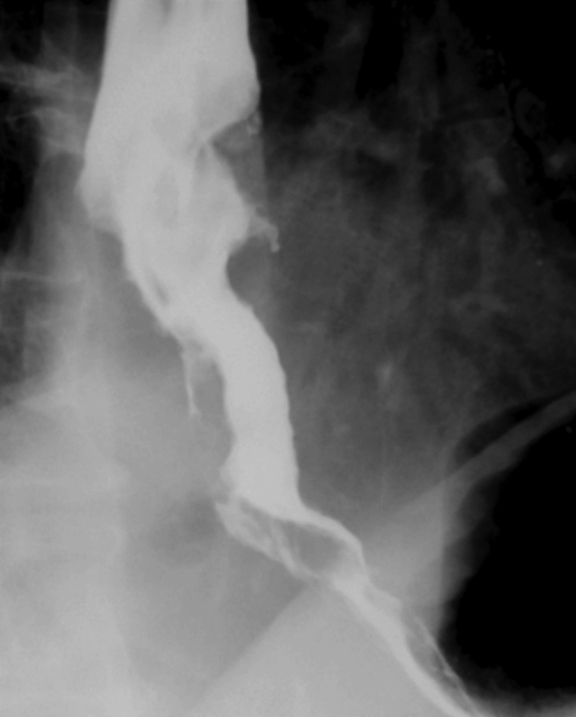 Risk factors for esophageal SCC include tobacco use, alcohol consumption, achalasia, and long-standing esophagitis.7 Adenocarcinoma is more closely related to GERD and Barrett metaplasia.1,2,7 Patients with pseudoachalasia from tumor infiltration present with an abrupt onset of symptoms, compared with benign etiologies.1 On fluoroscopy studies, carcinomas usually appear as eccentric or asymmetric wall thickening with irregular nodular mucosa, abrupt “shouldering,” and mass effect (Figure 4). The diagnosis is confirmed with endoscopy and biopsy. Upper GI and esophagography examinations are commonly performed in the setting of dysphagia with the primary goal of identifying potentially treatable areas of mucosal irregularity, ulceration, or stricture. Distal esophageal strictures are relatively common and are most often due to esophagitis, achalasia, or esophageal carcinoma. Each entity has fairly characteristic imaging findings, which often can be readily identified on fluoroscopic studies. Therefore, it is imperative that radiologists recognize these findings, especially in terms of distinguishing benign from malignant strictures, to help guide appropriate management and follow-up. Luedtke P, Levine MS, Rubesin SE, et al. Radiologic diagnosis of benign esophageal strictures: a pattern approach. RadioGraphics 2003;23:897-909. Gupta S, Levine MS, Rubesin SE, et al. Usefulness of barium studies for differentiating benign and malignant strictures of the esophagus. Am J Roentgenol 2003;180:737-744. Levine MS, Carucci LR, Disantis DJ, et al. Consensus statement of society of abdominal radiology disease-focused panel on barium esophagography in gastroesophageal reflux disease. Am J Roentgenol 2016;207:1009-1015. Carucci LR, Turner MA. Dysphagia revisited: common and unusual causes. RadioGraphics 2015;35:105-122. Hansford B1G, Mitchell MT, Gasparaitis A. Water flush technique: a noninvasive method of optimizing visualization of the distal esophagus in patients with primary achalasia. Am J Roentgenol 2013;200:818-821. Vaezi MF, Pandolfino JE, Vela MF. 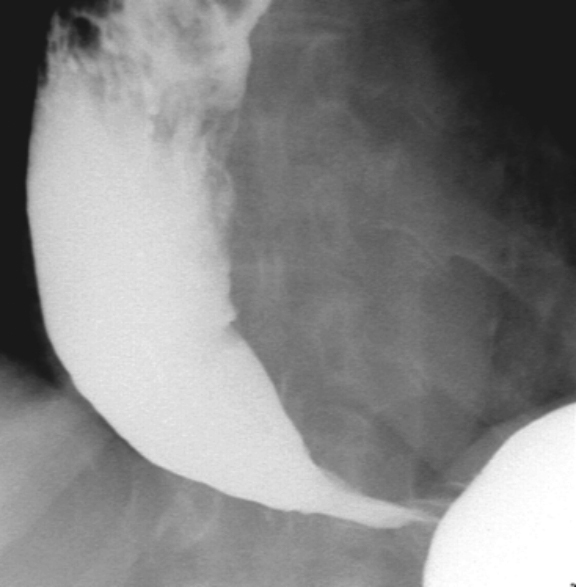 ACG clinical guideline: diagnosis and management of achalasia. Am J Gastroenterol 2013;108:1238-1249. Levine MS, Rubesin SE. Diseases of the esophagus: diagnosis with esophagography. Radiology 2005;237:414-427. Saenz R, Corley L, Franks Z. Gastroesophageal Junction Narrowing with Proximal Esophageal Dilation: A Case-Based Illustrative Review. J Am Osteopath Coll Radiol. 2019;8(1):11-13. Rocky Saenz, D.O., Lauren Corley, D.O., Zack Franks, D.O. Dr. Saenz, Dr. Corley, and Dr. Franks work with the Department of Radiology, Beaumont Farmington Hills, Botsford Campus, Farmington Hills, MI and Michigan State University, College of Osteopathic Medicine, East Lansing, MI.